You know we're big Gumbuya World fans here at KidTown Melbourne, so when we heard about all the egg-stra activities happening this Easter time, we've hopped to it to tell you all about what's on! Over the Easter long weekend, families will be treated to a heap of free events. On Easter Saturday at 3pm, Gumbuya World will host a Comedy Show. Be entertained by George Kapiniaris and Gabriel Rossi, a dynamic duo who will provide plenty of laughs for the whole family. On Easter Sunday, you are invited along to Gumbo’s Giant Easter Egg Hunt, thanks to the Ministry of Chocolate. There will be thousands of eggs to find plus 12 special eggs to find, with one containing a winning ticket for a very special 2 -foot chocolate treat. Over the Easter long weekend, you will also have access to a bonus 30 minute Gumbo Wildlife Show, featuring crowd favourites including the Macaws, Dingoes and Pythons. Grab a selfie with Gumbo, Gumbuya World’s mascot, after the show, too! On top of the egg-stras, don't forget Victoria’s newest theme park will be open every day during the school holidays from 11am – 5pm, giving you plenty of opportunities to enjoy epic adventures and create memories to last a lifetime this autumn. 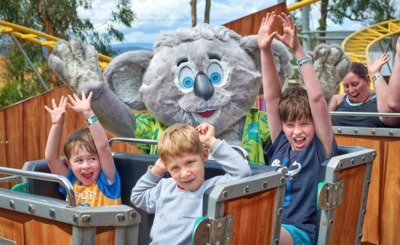 Gumbuya World, located just 50 minutes east of Melbourne, is perfect for a family day out across four worlds; Oz Adventure, Outback Explorers, Wildlife Trail and Oasis Springs. When: 10am - 5pm Daily.